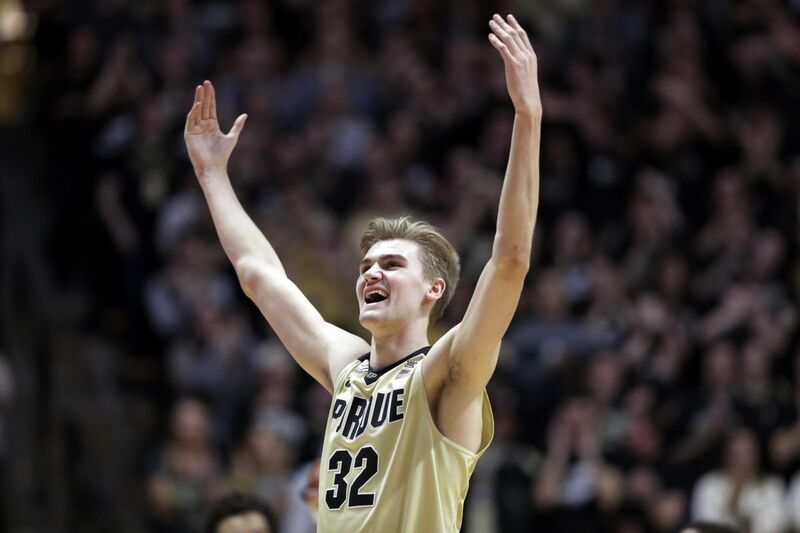 Purdue forward Matt Haarms has his team on the longest winning streak in Division I basketball. We take you back to the Thanksgiving holiday, to the Battle of Atlantis in the Bahamas, where Villanova looked forward to testing itself against Purdue and Arizona, two highly touted teams in the preseason. Ah, but the Wildcats never saw either in their run to the tournament championship. The Boilermakers and Arizona met on the final day to see which team would avoid last place, and that honor went to Purdue, 89-64. The losing team fell from No. 2 to completely out of the AP poll, an unprecedented drop. That seems like so long ago, however. Purdue and Arizona have combined to go 34-1 since leaving the Bahamas. The Boilermakers (22-2) own Division I's longest winning streak, 18 games. The Wildcats (19-4) avenged their only loss since that time, against Colorado, and lead the Pac-12. Purdue is one of the nation's most balanced teams, ranking third in offense and seventh in defense in the KenPom.com analytics. The Boilermakers shoot 43.2 percent from three-point range but also limit opponents to 39.4 percent shooting and allow just 63.7 points per game. Arizona, which has been the subject of an FBI investigation into widespread payoffs in recruiting, is one of the nation's top shooting teams at 51.5 percent and boasts one of the nation's best freshmen in center Deandre Ayton, who averages 19.7 points and 10.7 rebounds. The Boilermakers are locked in as a No. 1 NCAA tournament seed at the moment, but coach Matt Painter knows there's a long way to go. "The goal is to win the Big Ten," he said earlier this week. "Stay with what your goals are. Your goal is to win the league. We won our 11th conference game. It's not one of our goals." North Carolina, which carries a three-game losing streak into the weekend, is struggling with its three-point defense, having allowed 15 threes in back-to-back losses against North Carolina State and Clemson. "I have no answers," Tar Heels coach Roy Williams said after losing 82-78 to the Tigers. "I've never emphasized something as much in my entire life." The Tar Heels, who are just 5-5 in the ACC, rank 328th out of 351 Division I teams in three-point defense (38.5 percent). They've allowed a total of 240 threes, and only Tennessee-Martin and Delaware State have given up more. After being ranked No. 2 on Jan. 8, West Virginia has gone into a free fall, losing five of its last six games, and could tumble out of the rankings completely come Monday. The Mountaineers have taken pride in their "Press Virginia" nickname over the years, but their full-court pressure hasn't been working lately. Coach Bob Huggins had to call it off completely Wednesday night after Iowa State beat his team down the floor for easy baskets in a 93-77 WVU loss. "We can't press anybody," Huggins said after the game in which the Mountaineers forced just eight turnovers. Part of the reason is that West Virginia's shooting has been down in recent games, so it's been unable to set up its press. It would seem fine for a head coach to reward an assistant with a raise for the fine work he has done, but it's against NCAA rules, as Tennessee's Rick Barnes found out. Barnes admitted to a minor NCAA violation when he reached into his own pocket to boost the salary of assistant coach Desmond Oliver in order to make it equal with the pay of Vols assistant Michael Schwartz. "I just felt those two positions needed to be equal," Barnes told USA Today. "They felt it wasn't in the budget. I just said, 'I'm going to pay it myself.'" Barnes received rules education from the university but no further punishment for the violation, which was first reported by the Knoxville News-Sentinel through an open records request. A shoutout to Mississippi Valley State, which became the last of the nation's Division I teams to post its first victory of the season, a 72-67 win last Saturday over Jackson State. The Delta Devils got off to a 0-20 start before finally being able to celebrate a victory. MVSU played all 13 of its non-conference games on the road, including a three-game trip to Utah and two-game trips to Kent, Ohio and Chicago, to Pittsburgh and Akron, Ohio, and to Phoenix and Las Vegas. Junior forward Lamar Morgan, who played in high school at Westampton Tech, and senior guard Karonn Davis, who competed for Friends Central, are the top two scorers for Coppin State. The 6-foot-6 Morgan averages 11.6 and 5.2 rebounds and ranks fifth in the Mid-Eastern Athletic Conference with an average of 2.7 three-point baskets per game. The 6-2 Davis, a graduate transfer from Niagara, averages 11.3 points and is eighth in the MEAC in both assists (4.0) and free-throw percentage (79.7). Virginia at Syracuse, Saturday at 4 p.m., ACC Network: The Cavaliers are on a roll but some strange stuff historically has happened on Saturday afternoons in February at the Carrier Dome. The Orange defense allows 10 more points per game than Virginia but that's still good for ninth in the nation. Oklahoma at Texas, Saturday at 6 p.m., ESPN: Sooners freshman Trae Young, who leads the nation in scoring at 30.3 points per game, has received much national attention. But look for Longhorns freshman Mohamed Bamba (Westtown School), second in blocked shots at 4.52, to have his moments. Ohio State at Purdue, Wednesday at 8:30 p.m., Big Ten Network: The Boilermakers entered the weekend with the longest winning streak (18 games) in Division I and one game ahead of the second-place Buckeyes in the Big Ten. They have five players who all shoot 40 percent or better from distance. Duke at North Carolina, Thursday at 8 p.m., ESPN: So when was the last time these two teams renewed their storied rivalry without either one being in first place in the ACC? The Blue Devils are a distant second behind Virginia, while the Tar Heels entered the weekend riding a three-game losing streak. UCLA at Arizona, Thursday at 10 p.m., ESPN: Games between these two Pac-12 rivals always are entertaining because of the teams' offensive skills, and because you never know what Bill Walton is going to say on the telecast, with the exception of his repeated "conference of champions" references. Landale, one of six Australians on the Gaels' roster, is one of two Division I players averaging at least 20 points and 10 rebounds (Duke's Marvin Bagley III is the other). After Thursday night's win over San Francisco, Landale averages 22.3 points (11th in Division I) and 10.5 rebounds (13th), and shoots 65.6 percent (ninth) from the field. Landale has posted six games of 30 or more points, with a season high of 37 against Sacramento State. He has led his team in scoring in six of the last seven games.